FROME grandmother Jennifer Murray covered 34.9 miles of Chilean desert last week – the equivalent of nearly a marathon and a half – before having to pull out of the toughest footrace on earth due to injury. At 72 years of age Jennifer, from Hemington, is the oldest woman ever to have attempted the race across the Atacama Desert, and was the oldest competitor in the race by ten years. 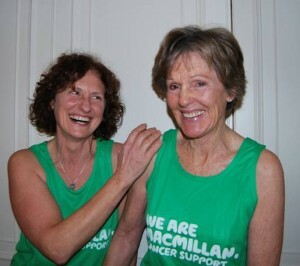 She took on the challenge to raise money for Macmillan Cancer Support. Along with running partner, head of Macmillan Support Line, Blanca Fernandez, Jennifer took on the vast Chilean desert that is 50 times drier than Death Valley and widely known as the driest place on earth. Temperatures can top 40C. The race itself is an epic 250km self-supported race lasting six days, in other words a marathon a day for six straight days. Although she had to pull out on day two on her doctor’s orders due to knee injury, Jennifer stayed in Atacama to cheer on her running mate Blanca. Jennifer is no stranger to adventure; in 2000 she became the first woman to make a solo helicopter flight around the world. In 2007, she successfully co-piloted the first helicopter to make a circumnavigation around the poles. She is also the author of three books, ‘Now Solo’, ‘Broken Journey’ and ‘Polar First’. Jennifer and Blanca have so far raised over £12,000 with donations coming in all the time and many people still pledging money whilst Jennifer was competing. However, the fundraising won’t stop for Jennifer now, and she has lots of fundraising events and activities in the pipeline to help the team reach their target of £50,000 in the coming months.